To be a member of a male voice choir is said to be one of those enjoyable experiences which is available to all men but very few have had the opportunity to enjoy. 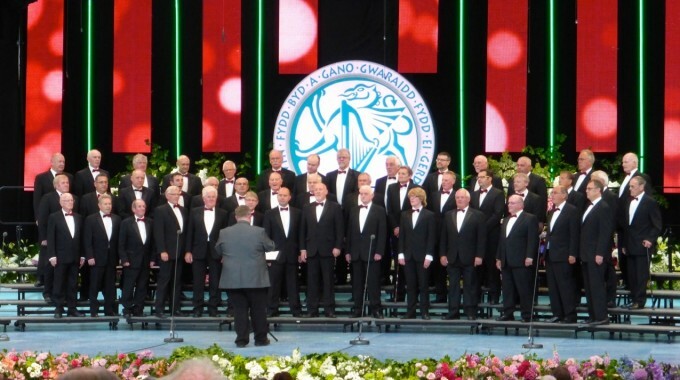 There is the enjoyment of meeting others at rehearsal and to exercise the brain in learning music and words to songs to sing without copies which Welsh Male choirs have always traditionally done. To have that goal and to perfect what is after all an art form gives immense satisfaction and great feeling of achievement. Then to have the ultimate joy in performing on various stages at different venues. To be appreciated by the applause of the audience, even to have a standing ovation. To experience that pleasure you give to others having enjoyed the pleasure of singing yourself. Côr Meibion Colwyn is proud of its long history recognising that there has been a choir in its home village of Colwyn since the 1890’s. Welsh is its first language however its rehearsals are held in both the medium of English with a good content of Welsh conversation. This is so as not to exclude our non Welsh speaking members but to also give them the ‘Welshness’ of the choir and opportunity to get to learn the language at the same time.